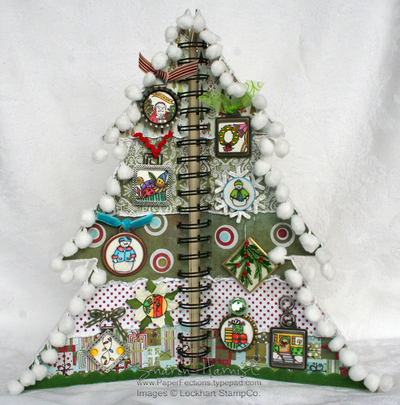 Ten Inchies = A Christmas Tree Album! So what are Inchies, you ask? I had never heard of them when Ellen Hutson & Karen Lockhart first mentioned them to me. They are a tiny, 1-inch square canvas to create or highlight your artwork, similar to ATCs (Artist Trading Cards). You can place them on chipboard, fabric, tiles, swap them with friends . . . the possibilities are endless! At first, I thought how in the world can you do much with a 1" square?!! But then just as Debbie Olson did, I created masks by punching a 1-inch square and circle in a piece of cardstock and started by placing them over the images I thought I might like to work with. It's fun to see the same images you may have worked with before take on a whole new perspective when cropped. 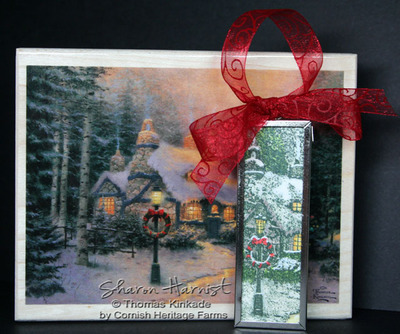 Be sure to click on Debbie's name above, to see her take on Inchies -- she created beautiful note cards to showcase hers! Then I started rummaging thru my craft stash (we all have those, don't we?!!) and pulling out anything that might frame or otherwise enhance a 1-inch image and tons of ideas started popping into my head! This is the first one I came up with, since the holiday season is upon us -- A Christmas Tree Album to showcase my Inchie Ornaments! The tree album was a gift from my sweet friend, Julie Brooks, is by Melissa Frances, and measures 11.75 inches tall by 11.25 inches across the base. Julie carries these albums in her online store, Doodliedoo, and by clicking on that link, you'll see what the album looks like unfinished. Below are the covers opened up so you can see both the front and back. I think I'll be filling this album with some favorite Christmas photos of my girls thru the years! The album's covers are chipboard and I began by removing the binding and covering the covers with torn pieces of BasicGrey's Figgy papers -- I LOVE the nostalgic feel to these papers! Then I highlighted the torn edges of the papers with Frosted Lace Stickles, to resemble snow. Next, I trimmed the edges of the tree with this great white chenille ball trim and a fun new green scalloped velvet trim I found at my local scrapbook store by Creative Imaginations. Starting back at the top left -- Believe Santa: This is a round Inchie (I'm not sure if "round" is a true Inchie or not, but I'm sayin' it is, LOL!) that I placed inside a bottle cap. 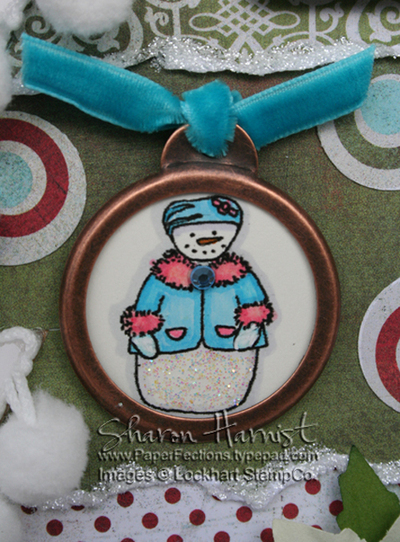 The image is colored with Spica Glitter Pens and Santa's fur trim is Stardust Stickles. I topped the bottle cap with a metal photo hanger and tied May Arts red striped ribbon on it. 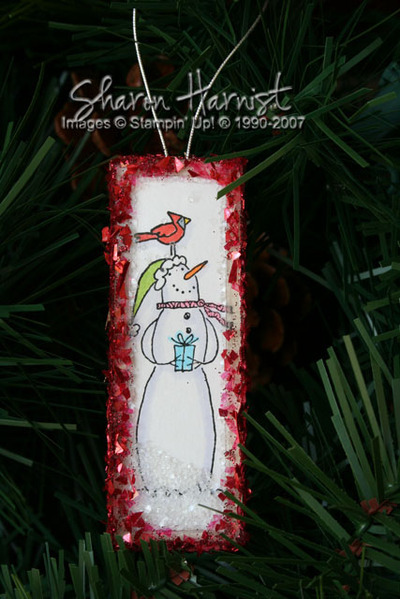 Child's Stocking: Maya Road silver frame. Colored with Spica Glitter Pens. The inside (image) dimensions are 1-inch, so overall this measures about 1.25". Again, I used a hardware clip as a hanger and tied on some red Wrights baby rick-rack. Mama Flurry: Colored with Copic markers and added Stardust Stickles on her snow parts. Bling button on her jacket is a blue A Muse Creative Candy Twinkle Sticker. Hardware is a round 1-1/8 inch (interior image size) copper book plate from We Are Memory Keepers -- I just trimmed off the bottom brad holder with Tonic/Tim Holtz' awesome serrated scissors -- they'll cut thru just about anything! A bit of Flair Designs blue velvet ribbon tops it off. 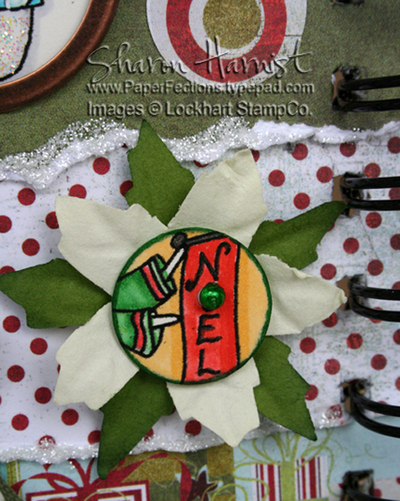 Noel Angel Poinsettia: This is actually a 3/4 of an Inchie (LOL!) -- I wanted more of the paper Making Memories poinsettia to show. Colored with Copic markers and accented with a flat-backed pink pearl (only color I had) that I colored green with a Copic marker -- it matches the angel's dress perfectly now! The edges of the image is inked with a marker, to create a faux mat. 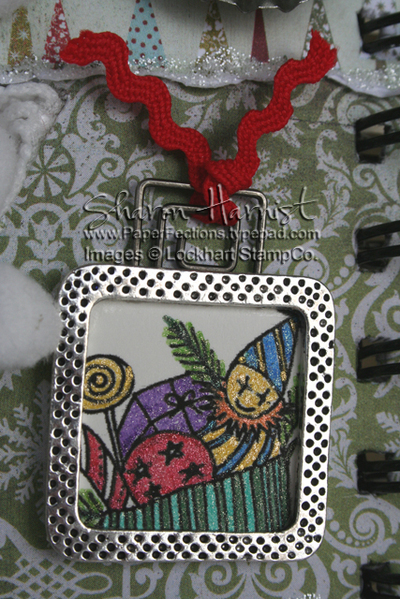 Ribbon of Lights: The overall size of this small Maya Road silver frame is 1-inch (the image size is just a little over 3/4-inch) and it showcases just a portion of this 5.25" long string of Christmas lights border stamp. They are colored with Spica Glitter pens and accented with Sunflower Dew Drops. The Dew Drop wasn't as bright of a yellow as I would have liked, so I colored it with a Copic yellow marker to darken it! Again, I added a metal hardware hanger to the back of the frame that I tied Stampin' Up's green stitched ribbon thru. Wreath Angel: Colored with Spica Glitter pens and blinged with A Muse Creative Candy Twinkle stickers. Stampin' Up's Antique Brass hardware book plate has the bottom brad holder cut off and allows for an image size of just under 1-inch. May Arts green swirled ribbon. Nicholas Flurry: 1-inch round of sweet Nicholas was colored with Copic markers and a Making Memories 1-inch Page Pebble placed on top. 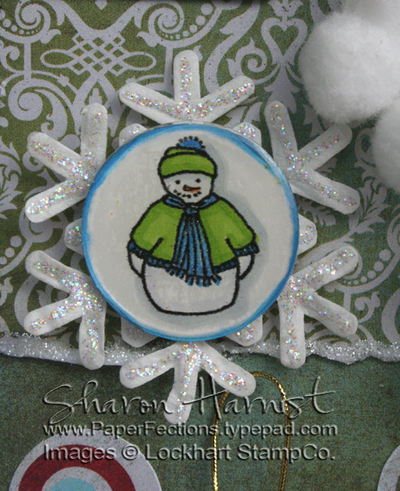 He's secured to a Making Memories paper snowflake that measures 1.75" that I highlighted with Stardust Stickles. The snowflake is then given some more stability and lift with a 1-inch chipboard circle underneath it. 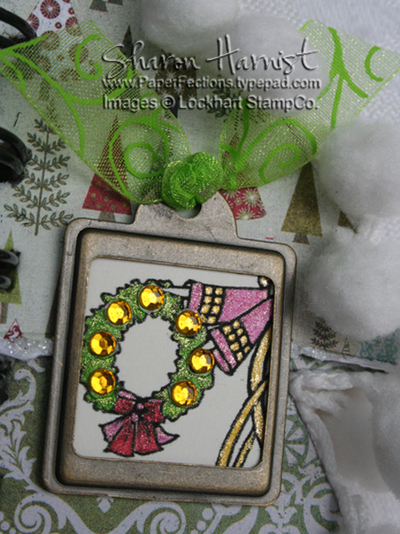 Holly (Holiday Millinary Embellishment): Image colored with Spica Glitter pens, placed beneath a square page pebble from Creative Imaginations that's 1.25" square. Then I made a faux frame on top of the page pebble using Zig's Gold Painty Pen, so it brings the stamped image size down to 1-inch. It is backed with a square piece of white chipboard I cut from a coaster (you know, that huge supply you had to have and still haven't done anything with?)!! I sandwiched some gold cord between the image and the chipboard backing, to serve as a hanger. A Muse Creative Candy Twinkler Stickers were placed on top of the page pebble. 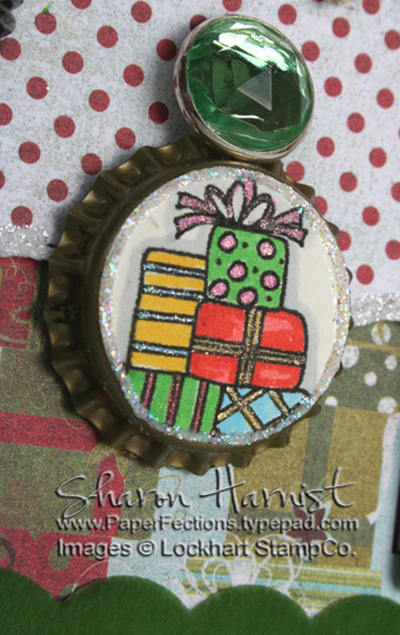 Packages Bottlecap: 1-inch circle image punched and placed on the top of an antique gold bottle cap. Image colored with Copic markers & Spica Glitter pens. Image outlined with Stardust Stickles and topped with a Making Memories large green crystal brad. 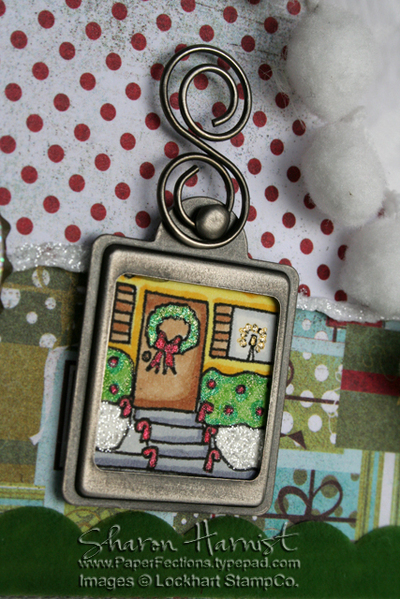 Holiday House: Stampin' Up's Pewter hardware 1-inch book plate -- again, has one of the brad holders cut off. SU's pewter swirl clip & brad created this hanger. Image colored with Copic markers & Spica Glitter pens. ETA: Details are complete now! Don't forget that most of the products you see here came from Ellen Hutson's online store, where she's having a 15% off sale this weekend, thru Sunday night. Just enter the code "CELEBRATE" upon checkout, to receive your discount. Be sure to check out what Michelle Wooderson did with her Inchies and she also has previews of some new Lockhart stamp images that were just released for sale today! Click on that "new" link above and that will show you all the new images for sale in Ellen's store! Cindy Lyles is also new to the Hutson-Lockhart team and she shares her beautiful take on Inchies, too! What a fun week I've had . . . aside from still recovering from bronchitis/upper respiratory infection and consequently strained neck muscles from all the coughing I've been doing over the last two weeks -- ugh! A stiff neck makes it hard to do much stamping or creating but I had a blast yesterday creating something I'll share with you later this morning. (Read: I'm still finishing and photographing!). But a few weeks ago, Ellen Hutson & Karen Lockhart approached me, wondering if I'd like to join their team of multi-talented women. Well, of course! I've admired Karen's beautifully drawn rubber stamps for quite some time, since they are all line images which are perfect for coloring (my favorite thing to do as a rubber stamp artist) and they are all so elegant! You'll want to visit her website (linked above) and check out all the coloring tutorials and card samples she shares there. I've been a customer of Ellen's since she opened her online store, where she is the exclusive online retailer for Lockhart stamps and carries fabulous, innovative new products, tools & embellishments. She's usually the first to either discover and provide to you unusual products that no one else carries or is the creative mind behind helping to develop new ideas such as the Spellbinder Nestabilities embossing dies which we've all come to love and have knocked the socks off the scalloped retail punch & die cut industry! Ellen's store customer service is the best around, and now you can read more about the women who help her out each day HERE. To find out more about Ellen's other associates I've joined, check out THIS post. I've known them all for several years and it's quite and honor for me to join them! The fun, new project idea I mentioned yesterday is called Inchies -- have you heard of them? If not, you can read a little more about them HERE on Ellen Hutson's blog. They are somewhat akin to ATC (Artist Trading Cards) but with a smaller canvas to work with -- just 1 square inch! I'll be back a little later to share my Inchie project with you! And don't forget about Ellen's online store sale that started today -- everything is 15% off! Just enter the code CELEBRATE upon checkout and your shopping cart will then reflect your discount! 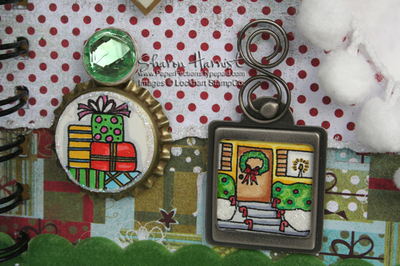 Tim Holtz . . .
. . . did you know he now has a blog? And, of course, it's quite cool, just like him. 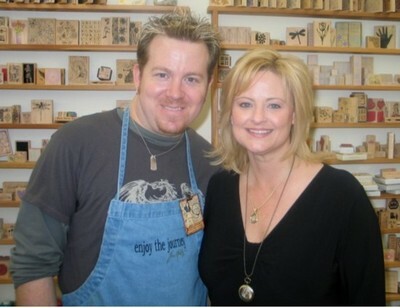 Check it out: Tim Holtz Blog. Scroll down a few posts and you'll see his studio space -- Wow, very vintage (which I love)! It's very nice to see a man's perspective on how to organize and store crafting products -- some really neat ideas! It was the most fun I've ever had at a class and was SO informative on how he designs his products! If you ever get a chance to take one of his classes, don't pass it up! 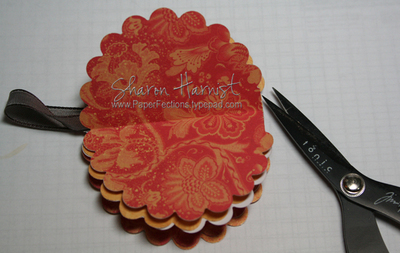 Scalloped Note Card & Sale/Giveaways! Oops, sorry -- I should have outlined that photo or used colored cardstock . . . the white note card is blending into my blog background here! Just imagine the white below the die is a piece of folded cardstock, okay? LOL! The photo above is what the die looks like when it's facing up on my cutting plate when it goes thru my Cuttlebug (I cannot wait to get my new Wizard machine next month!). Basically, you don't want all of the top fold to be cut -- leave some space at the top (or side) for a "hinge". I successfully cut thru two layers of thicker cover-weight (105 lb.) cardstock with my Cuttlebug machine just fine . . . with just a tiny bit of creaking & praying that my B plate wouldn't crack! If you want to play it safer, use a lighter text-weight cardstock or paper. I hope that helps . 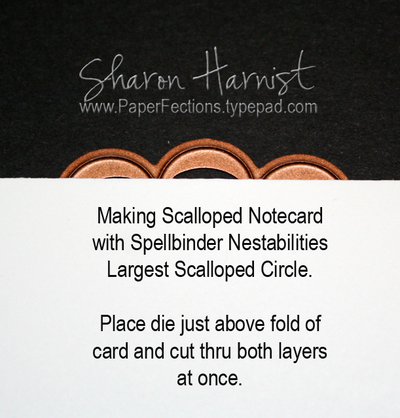 . . creating these little scalloped note cards are one of the main reasons I first wanted the Nestabilities! You'll want to check back here tomorrow (Friday) for a fun, new idea a few friends of mine have cooked up . . . nothing you've probably ever seen before! Until then . 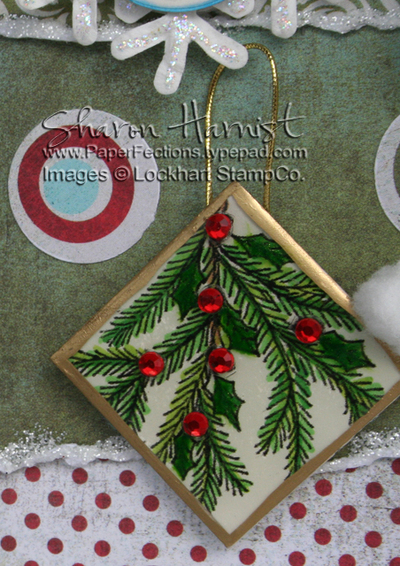 . . remember to keep a watch on Ellen Hutson's blog for some terrific samples of new Lockhart Company stamps that will be released for sale tomorrow, as well as some giveaways she's having! And don't forget that everything in Ellen's online store will be 15% off for the weekend, beginning tomorrow morning at 12:01am PST! This birthday card is a wee bit late for the recipient -- I hope she forgives me! I used SplitcostStampers' weekly sketch challenge for the layout and these bright & cheery glittery papers are from DCWV's Glitter Mat Stack -- aren't they fun?!! 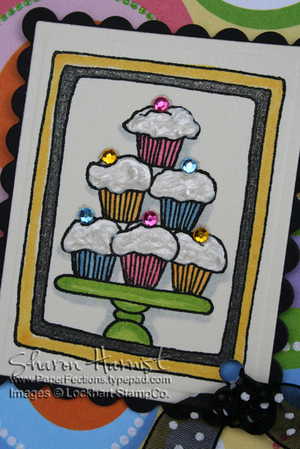 I began by stamping Lockhart Company's Cupcakes in Brilliance Graphite Black on shimmer ivory cardstock and colored them with Copic Markers. The frosting is Liquid Pearls . . . I love this dimensional paint, it's perfect for creating swirly frosting! Then, a little Creative Candy bling garnishes the tops of these cupcakes. More glitter was added in the black drawn mat by coloring it with Black Spica Glitter Pen -- wowee, you should see all the sparkle this card has in person! The main image was then cut & embossed using Spellbinders Nestabilities Classic Rectangles and matted with a Scalloped Rectangle of black, then mounted with dimensionals to the card. Here's a closeup of the cupcakes -- I loved the way they turned out! Black zig-zag machine stitching accents the side vertical striped paper and black brads embellish the top horizontal squiggles. A bit of black dotted organdy ribbon finishes this card. SUPPLIES -- Stamps: Lockhart Company Cupcakes. Paper: SU Black, Curious Iridescent Poison Ivory, DCWV Glitter Mat Stack. Ink: Brilliance Graphite Black, Copic Markers. 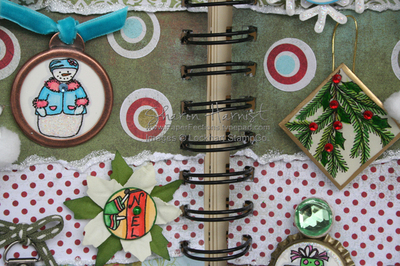 Accessories: Copic Spica Black Glitter Pen, Ranger Liquid Pearls, A Muse Creative Candy Twinkle Stickers, Spellbinders Nestabilities Classic & Scalloped Rectangles, May Arts Ribbon, SU Black Vintage Brads, Dimensionals, Sewing Machine & Black Thread. All supplies (except brads & ribbon) are available from Ellen Hutson's online store. Hurry on over to Ellen's blog, as she's having a one-year-in-business birthday celebration herself this week! Be sure to check out this post and enter your comment for a chance to win some brand new Spellbinders Nestabilities Scalloped Heart dies . . . yes, you heard me correctly! Be sure to check out Ellen's other posts this week on her blog, for previews of some new Lockhart stamp images that will be released this Friday, just in time for the sale! There are some fabulous projects she's posting this week and you don't want to miss one! And then starting this Friday, November 30th at 12:01am PST the celebration continues, with EVERYTHING in Ellen's online store at 15% off thru Sunday, December 2nd!! Just enter the promo code: CELEBRATE upon checkout to receive your discount. 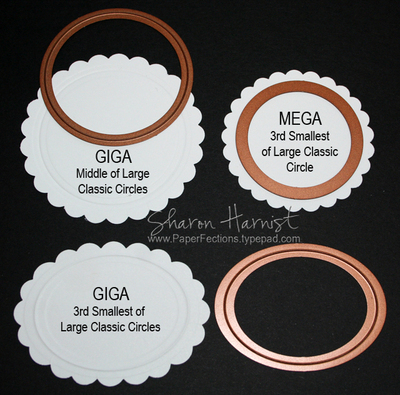 For Marvy's Giga Scalloped Circle, I found the 3rd largest of the Spellbinders Nestabilities Large Classic Circle Set fit best, when fully embossed. I don't know how well it shows for you in the photo below, but the very outside of the Nestabilities die embosses right up against the scallop indents of the Marvy punch. So my best assessment for this question would be the Large Classic (straight, not scalloped) Spellbinder Nestabilities Oval and Circle sets matches best. I hope that helps, and don't forget about Ellen Hutson's online store sale starting this Friday, November 30th at 12:01am PST -- even the Nestabilites will be included in her sale! Be sure to watch Ellen's blog for some giveaways and answer yesterday's post for your chance to win a new set of Spellbinders Scalloped HEART Nestabilities -- WOW!! 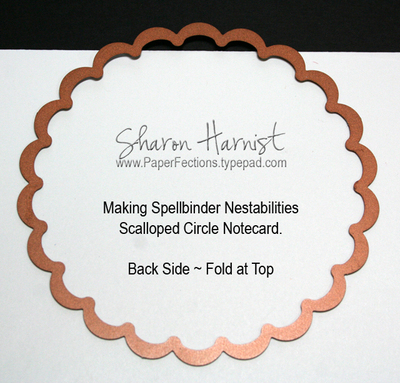 I've had a few questions about the Spellbinders Nestabilities Scalloped dies lately and I thought I'd share my findings. One wanted to know which sizes of Nestabilities Scalloped Circles & Ovals most closely matches the larger Marvy Scalloped Punches. 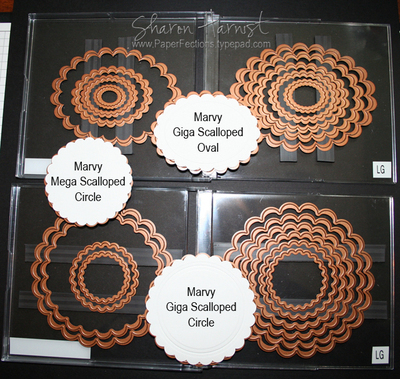 In the top photo, Marvy's Giga (largest) Scalloped Oval is most closely matched with the Spellbinders 2nd to largest of the Small Scalloped Oval Nestabilities. My Nestabilities sets are housed in CD cases -- the small sets on the left and large sets on the right. 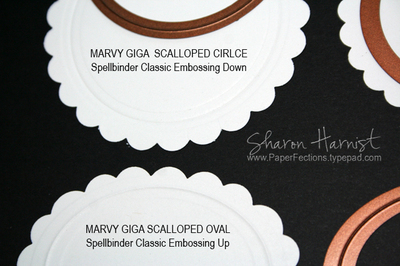 The Marvy Giga Scalloped Circle Punch is most closely matched with the Spellbinders 3rd to largest of the Small Scalloped Circle Nestabilities. The Mega (next to largest) Marvy matches the next smallest size (3rd to smallest) of the Small Scalloped Circle Nestabilities. As you can see, the Spellbinders have at least 2 to 3 larger shapes than Marvy's largest punches. I hope this helps in your selection of the Spellbinder Nestabilities dies! 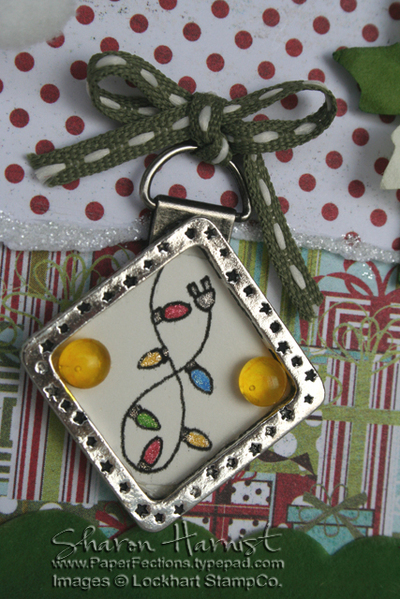 This Christmas tree ornament was made with 2" x 3" microscope slides. I really like this size better than the 1" x 3" since you have more "canvas" to work with. As soon as I find a good source for these slides, I'll post it -- these were given to me by a friend (many thanks, again, Sharon B!). 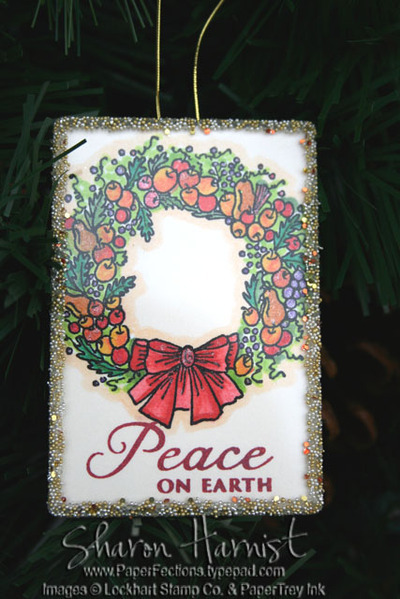 The stamp is Lockhart Company's Autumn Wreath and was colored with more "Christmasy" colors. Sentiment is from PaperTrey Ink's Believe set. 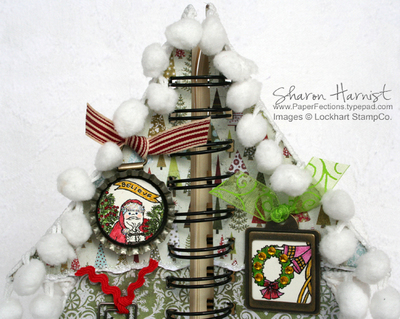 For instructions on these ornaments, please see the tutorial I did HERE on SplitcoastStampers. 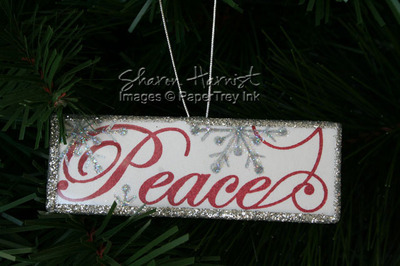 These would be great projects for this weekend, to get ready for your holiday decorating! Be sure to check out the other tutorials that were posted over the last two weeks of Holiday Tutorial Blitzes HERE for lots of gift and decorating ideas! 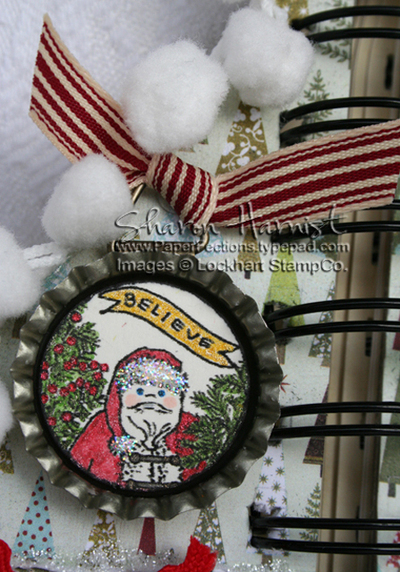 ^ Stamps by Stampin' Up! My friend and fellow SplitcoastStampers Dirty Girl Alumni, Jami, issued a challenge to current and past Design Team members and since I love a challenge (and new stamps! ), I accepted! * Required - Use the color Pretty in Pink in your card or project somehow, somewhere. I had forgotten about that last requirement, so that's why I'm late with my card . . . I had to start over again from scratch this morning, using no designer paper, AFTER attending my youngest daughter's Kindergarten Thanksgiving play! THEN, my computer held the card image hostage until now -- ARGH, I'm about to drop-kick my laptop to kingdom-come! Since these images are pretty small, I decided I wanted to make a round card, so I started by cutting a scalloped round of Stardream Metallic Rose Quartz cardstock (a perfect match to Pretty in Pink!) with my largest (4") Spellbinders Nestabilities Scalloped Circle. The card base was stamped with a snowflake in Brilliance Moonlight White and the edges inked with Brilliance Graphite Black. Elzy was stamped in Graphite Black on Curious Iridescent Cryogen White shimmer cardstock, cut out with Spellbinders Nestabilities Classic Circles, and colored with Copic markers. The snow and edges of the circle were glittered with chunky glitter, as was the Heidi Swapp Ghost Snowflake. In the center of the snowflake is a flat light pink pearl. I decided to try and use the sentiment (Elzybells' Sending Winter Wishes) as an ornament hanger and make little Elzy and her bird a sort of ball ornament, with the ribbon as its hanger . . . did I succeed? Be sure to check out this cute new stamp line that A Muse Artstamps is the exclusive distributer for North America AND the gallery link above, to see all the fabulous cards my fellow Dirty Girls have created! Another Friday and another sketch challenge from Beate. 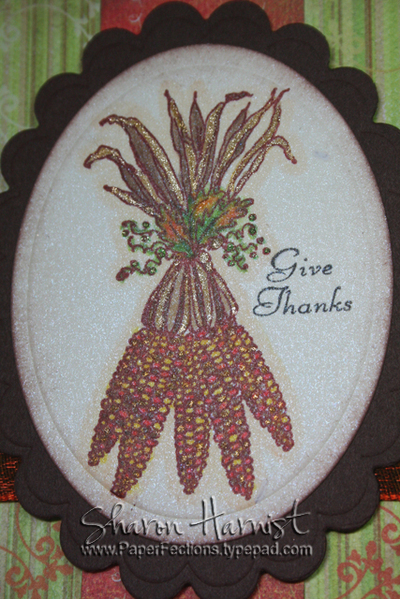 This week, I used this Lockhart Stamp Co Indian Corn image and paired it with Stampin' Up's retired sentiment set, Fancy Flexible Phrases, for a Thanksgiving card. I began by stamping the corn in Brilliance Coffee Bean on Curious Iridescent Poison Ivory cardstock and then embossed/die cut it with Spellbinders Nestabilities Classic Oval. The image was colored with Copic Markers and then highlighted with Copic Atyou Spica glitter pens (gold & melon). Here's a close up of all that glitter you all know I love! Then I matted the image with a Spellbinders Nestabilities embossed cut of chocolate Scalloped Oval; all was mounted with dimensionals to the card. 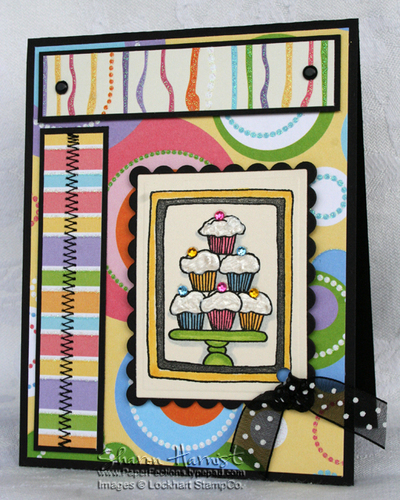 The card base is a Memory Box Paprika note card and the patterned papers are from Memory Box's Studio 6x6 Studio pad. This layer was distressed with Tonic's Edge Distresser and has a beautiful May Arts shimmery copper-edged chocolate ribbon tied around it (from Anna's Sassy & Sweet Crafts online store). The finishing touch are three tortoise-like Dew Drops -- aren't those delightful?! Be sure to try this sketch this weekend and check the samples from Beate, Charmaine Ikach, Jenn Balcer, Laurie Schmidlin, Lori Craig and MaryJo Albright -- they always knock my socks off! I adore this Snowflake Serenade set by PaperTrey Ink -- the sentiments are such a beautiful font and snowflakes so elegant. If you missed out on getting it last month, it's back in stock -- so hurry on over to get one! I stamped the snowflakes with Brilliance Moonlight white on kraft cardstock and highlighted them with Stickles' new Baby Blue glitter. "Joy" was stamped in Brilliance Graphite Black. 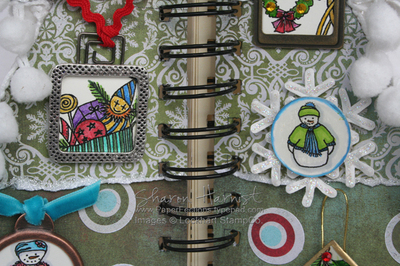 The kraft piece was embossed and die cut with Spellbinders Nestabilities Classic Rectangles and then the embossed edge outlined with white gel pen. The Bashful Blue mat was cut with Nestabilities Scalloped Rectangle. The black background is Stampin' Up's Textured cardstock and it was distressed with Tonic's Edge Distresser on the card on the right. The black layer on the left card was machine stitched to the PaperTrey Stamper's Select White cardstock base. Both cards were finished off with Stampin' Up's blue taffeta ribbon. I'll be back tomorrow with Beate's Weekend Sketch Challenge, so come back now, you hear?!! You all know that I love my Nestabilities embossing dies this company makes, so you can definitely be assured of seeing a lot more projects with them, as well as many more products this wonderful company produces! When I saw the link on Emily's blog to these darling pumpkin placecards Joanna at Crafty Kid had made (click on Joanna's name and you can read her tutorial), I knew I had to try them with my Spellbinders Nestabilities Scalloped Ovals! The link to Emily's blog shows how she made the pumpkins into round Christmas ornaments. For my pumpkin, I used Daisy D's Brighten My Day 8x8 pad which has some rich colors that reminded me of Fall and the largest of the large set of Nestabilities Scalloped Ovals. Basically, after cutting 8 ovals (and you can do this quicker by cutting thru two layers of thinner paper-weight paper at a time), you fold them in half (with the side of paper you want showing on the inside of the fold) and glue them together. Place a loop of ribbon in the last section that you glue together. I sponged the edges of each section with cocoa ink. Then I attached a small Nestabilities Scalloped Oval cut of olive cardstock and my name (computer generated on vanilla cardstock) die cut with the Classic Oval to resemble a leaf. I think I'll be making more of these to set at each place of our Thanksgiving table this year! Got Ribbon / Need Ribbon? Jody Morrow is having another ribbon share you might not want to miss out on . . . check it out here: Confessions of a Ribbon Addict. She has that yummy wide May Arts satin ribbon, very similar to the holiday wide satin chocolate and pomegranate Stampin' Up currently has. I hope to be back soon with some new creations and that blog giveaway I promised, but have been under the weather the last few days. Are you ready for the 12 days of Christmas yet? If so, then go to Terri Conrad's blog and follow the instructions there to play along. Terri is the creater of that gorgeous new paper line, Webster's Pages, that you've been hearing a buzz about. Even if you're not in the holiday spirit yet, she'll be giving away lots of goodies each day, so maybe that will get you jump-started! 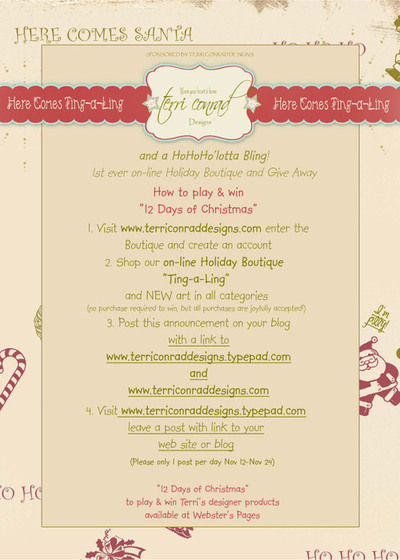 You can also visit Terri Conrad Designs to see more of her creations there. Good luck -- the giving begins tomorrow, November 12!